I had a lot of ideas I wanted to share. In fact, thinking about it now as I write, I should have known that I was feeling ambitious. That something would come in the way of my plan. I wanted to tell you about Spring, and how excited I am that it is here, and that on the very first day of Spring, we visited the farm again. Not only because Lulu has been insistently asking to see les moutons et les poules first thing in the morning every day, but also because it was 70 F outside–oh yes it was!–and while Lulu loves the farm because it’s like a enormous playground with funny-aha creatures inside it, I find it healing to see the animals, smell the ground and touch the grass, and have my boots covered with mud. Then, I wanted to show you the parsley root parsley fritters I cooked. The pear and chocolate tart I prepared last Thursday when Lulu was in daycare. And even the strawberry cake I baked–and before you tell me that it’s not yet the season, I know. But the reality is that I’ve been using and eating a lot of strawberries lately and yes, they even tasted good. And even better, they made me feel cheerful. Well. I cooked a ton within the last week. That’s also therapeutic. And I think we were just ready and prepared to see winter go and welcome budding flowers and trees dressing up in green again instead. It’s cyclical. Seasons are beautiful this way. Friday was gorgeous, and Lulu and her friend R. played like best friends, running after each other, giggling together and hugging–it was so cute to watch. Saturday was almost as nice but perhaps a tad cooler. Then Sunday….is when things started to turn sour. It was cold again. We went out for a walk in the morning but came the afternoon and Lulu and I started to feel sick. With a cough first. Then a light fever. And while I felt better on Monday, my poor little one was actually sick. And it was snowing again. So in the place of all these nice things I had planned to write about, I made a green lentil salad, and thought that at least I could tell you and write about that. I had just received a package with beautifully knitted dresses for Lulu from my mother–Have I told you already what a wonderful knitter she is? 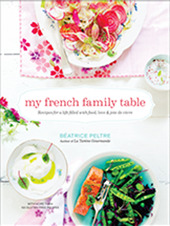 Merci maman !–and with it came the last issue of Elle a table magazine. A treat. That’s where I found inspiration to make the salad. I am writing about my version of the recipe. It felt good to eat warm green lentils with refreshing ingredients like finely shaved fennel, delicate quail eggs and crunchy pieces of apple and green asparagus. It was like having a slice of Spring in my plate. I ate two servings. Yes. Just by myself while Lulu was napping upstairs. And then I finished with strawberries coated with sugar and yogurt on the side. Even happier an hour later when I found a smile back on Lulu’s face who was finally hungry for lunch again. I felt appreciative of what I had. To prepare the vinaigrette, in a small bowl, add the ingredients in this order: salt, mustard, lemon juice and shallot. Stir and add the oils. Emulsify with a small fork; set aside. Place the green lentils in a large pot. Add 2 cups chicken stock and 1/2 cup water. Add a few twigs of thyme and a bay leaf. Season with salt and cook the lentils on low heat, covered, for 45 minutes to 1 hour, or until they are tender. Remove the excess water. In the meantime, bring a large volume of water to a boil. Add a pinch of salt and blanch the asparagus for 1 minute. Rinse them under cold water. Slice each spear in 3 pieces. Divide the lentils between plates or serving glasses; set aside. Boil the quail eggs for 3 minutes and place in cold water. Remove the shell delicately and half each egg; set aside. In a large bowl, toss together the shaved fennel, the apple, watercress and asparagus. Dress with the vinaigrette. Top the lentils with this salad mixture and add the eggs. Sprinkle with red peppercorn and coriander, and then serve. Pour préparer la vinaigrette, dans un petit bol, ajoutez les ingrédients dans cet ordre: sel, moutarde, jus de citron et échalote. Mélangez et ajoutez les huiles. Emulsionnez avec un petit fouet. Placez les lentilles dans une grande casserole. Couvrez avec le bouillon et l’eau. AJoutez le thm et la feuille de laurier. Salez et couvrez. Faites mijoter pendant 45 minutes à 1 heure, jusqu’à ce que les lentilles soient tendres. Egouttez et réservez. Pendant ce temps, faites blanchir les asperges dans un grand volume d’eau bouillante salée. Rinsez-les sous de l’eau froide et coupez chaque pointe en 3. Mettez les lentilles dans quatre assiettes ou verres. Faites cuire les oeufs pendant 3 minutes, puis écaillez-les. Dans un grand saladier, mélangez le fenouil, la pomme, le cresson et les asperges. Ajoutez la vinaigrette et mélangez. Disposez cette salade sur les lentilles et ajoutez les oeufs. Assaisonnez de baies roses et de coriandre. Servez aussitôt. This is such a beautiful spring-inspired post. I love the pictures, the sheep, the seedlings and the lentils. If only the weather stayed beautiful and warm. Hope Lulu feels better soon. Quail eggs! How wonderful! Where do you find these? Lovely post and pictures. Will you share the parsley root fritters recipe? I often find parsley root in my CSA box and so far I’ve only roasted it. I’d love a new recipe. beautiful Bea! I hope you both are feeling better, take care! This salad is a treat. So springy (is this even a word?). It’s really awful when you are already tuned to spring and then it starts to SNOW again. That’s like totally against the rules. We had the very same here. The whole week it felt like spring. Birds singing, the snow was starting to melt and the sun shined all day long. And then Saturday I woke up and looked out of the window and it was snowing… And it snowed the whole day! *ugh* I don’t really know how many times I heard the phrase “It’s snowing…” when I was in the city. But now spring seems back again. Love it. Hope you both get well soon! I must make this salad! Just back from a holiday so am drawn to more healthy eats like this at the moment. Get well soon! I hope you are both feeling much better! This lentil salad looks delicious (I love eggs and lentils together). The weather can be frustrating, it’s one of those things we can’t control and wish we could. Hopefully it will start to warm up for you soon! Thanks for a lovely post. Pareil ici(au sud de l’ Espagne),Week-end magnifique et lundi pourri.Pas de neige, mais beaucoup de pluie. J’espère que vous vous débarrasserez vite de ce vilain rhume! Chez nous très peu de rhume et autre virus depuis qu’on prend régulièrement de l’echinacea. Tes photos et recettes sont toujours aussi inspirantes!! I was on the same page with you yesterday as I made my own rentidition of French Lentil salad. Yours look wonderfully complex with all the different flavors. Love your site. This is my first visit! I’m so intrigued by those parsley roots! Lentils and quail eggs…. two of my favorites! I’m catering a large “wellness” luncheon next week and couldn’t decide what to sever…. I think we have a winner! Bea, you always bring a smile to my face and a tear to my eyes! Another stunning blog entry. Hope you are both feeling much better soon!!! Beautiful! I love green lentils a lot! Just made into a stew with sausages, carrots and lardons.. Your posts, my friend, are absolute bliss. There are days when it is just what the doctor ordered – as I was in need of some inspiration this spring morning. merci. Wow. You always put together the most interesting flavor combinations. Unexpected pairings, but ingredients that make sense after all. Pear and chocolate tart? Yum. Parsley root fritters–I must try. Keep doing what you do–so inspiring. When is your book going to be published? I can’t wait to see it. I have a feeling I will feel bad about using it in the kitchen to avoid spilling on what I think will be a beautiful book. Lentils are so generous. Earthy, substantial and so versatile. Thanks for sharing another lovely way to enjoy them. Oh oui quelle joie de retrouver le printemps! Les photos sont très inspirantes, c’est une belle création que cette recette aux lentilles. Et j’aime beaucoup les racines de persil, je ne connaissais pas du tout! We don’t get snow in our part of California but I can empathize with the on-again-off-again start to spring. Things were warming up last week until we got another winter storm. Le sigh. I’m just beginning to discover how versatile lentils are – so far I’ve only been using them in soups. Pairing them with quail eggs sounds absolutely divine! Mars est le mois avec les plus grands écarts de température : il peut faire -20° et 20°C, soleil, neige, pluie, tout est permis en mars! J’ai fait ce genre de tarte aux poires et au chocolat, recouverte d’un biscuits… mais sans pâte dessous. Une autre variante pour ce beau mariage poire/chocolat. I know, this return to winter is not making me happy! I need a good spring salad to perk me up too! This looks lovely. I need to buy some pistachio oil – I bet this dressing is wonderful for all sorts of salads, and even drizzled on roasted veggies. Hi! Your salad looks delicious but Im wondering if you would put up the recipe for the pear and chocolate tart? For those of us with the sweet tooth! Thanks! It’s great to follow how much you are cooking be a. All I wish it’s I were there to taste it! 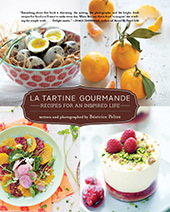 I saw the the lentil verrine in the latest issue of ELLE a table and bookmarked it too. Lovely indeed. Miam, je vais le faire ce weekend, MERCI! If only it hadn’t snowed today… I would be with you in your sentiments… but alas, we haven’t been getting the spring weather we so desperately want. But posts like these make even the gloomiest of days a little brighter. Thank you. Oh Strawberry Cake! Gluten Free? Please share! Rien de tel en effet que les lentilles et leur apport en fer pour donner un peu de tonus au corps souvent sensible à cette période de l’année. can’t can’t can’t wait for the book! Ça a l’air délicieux! Vite vite, en français. Es tu au courant que quelqu’un vend tes photos sur Etsy sous forme de carte postale? Merci encore pour toutes ces fabuleuses recettes, à Noël j’avais fait un tabac avec un diner 100% La tartine gourmande. There is one coming up in June, it will be a French vacation you will never forget. The tour will be visiting an organic farmer that grows green lentils, a baker that grows the wheat he uses to bake his bread in a wood fired oven, a biodynamic vineyard and more. Truly a unique culinary tour, with a maximum of 7 people. Hello – I have been looking around for inspiration and found your blog…I am so impressed! I LOVE your photographs! This first post that I found of yours absolutely blew me away. I am so motivated to improve my own forays into web design, now that I have seen your beautiful food photography. Thank you! Toujours une joie de voir vos photos. I love the recipe, I love the blog, I love the photos. This really brightens up my day. Hi Bea, the last time I cooked puy lentils with my pressure cooker, the lentils were already mushy. How long do you recommend I cook it for with the pressure cooker? Hello! Am a Chilean journalist and I want to tell you that this is the first time that I read your blog and I loved it! I loved the recipies and the stories and the pictures. I really do. Congrats! !